By buying this product you can collect up to 191 bonuspoints. 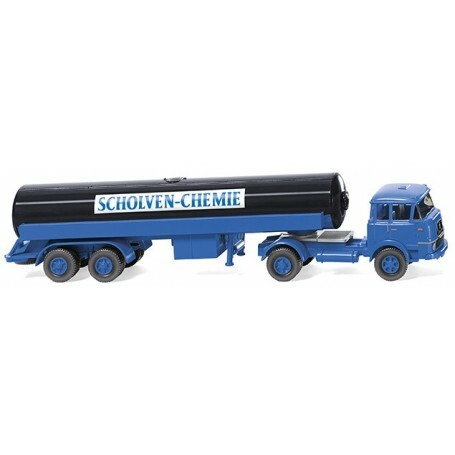 Tanker truck (Krupp) 'Scholven-Chemie', 1964. Driver's cab blue, radiator grille black, interior iron-grey, front fenders as well as chassis and wheels blue, fifth wheel plate silver. Radiator grille, ornamentation and Krupp lettering on front painted silver. Headlights silver, indicators printed orange. Door handles and handrail silver, tail lights printed carmine red. Semi-trailer with chassis and double fenders as well as tank base, stabilizer legs and Trilex wheels blue. Upper part of tank blue-black. Blue lettering 'Scholven-Chemie' printed on side of tank. Tail lights carmine red.